UM students and employees can have free shuttle bus which services between UM and nearby places. 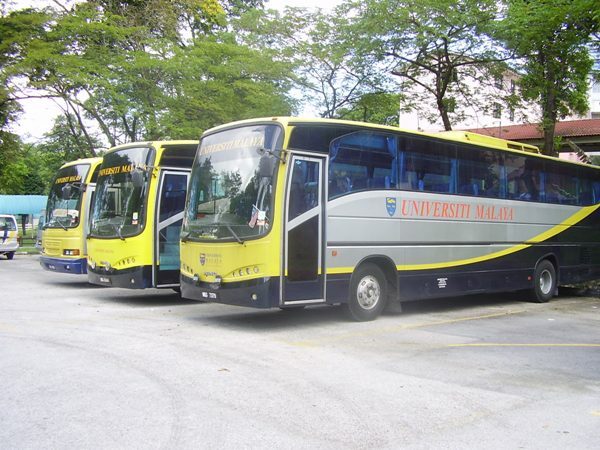 To view more photos of UM Shuttle Bus , Click Here. In UM, the library station is used as the bus terminal. From library you can use UM Shuttle bus or RapidKL T632 to Bukit Angkasa and Universiti LRT Station. The routes provided by Student Affairs Department of UM are as below, click on the links to bring you more detail about the routes. and what are the fares ? Hi, you can take KTm from KL Sentral to Taman Wahyu, then take SJ Bus 152 to Taman Selayang Jaya. how much the bus fare ? It should be rm1.90 for the bus trip. are there any public transport to Klinik Kesihatan Kuala Lumpur ? how to go to Hospital Kuala Lumpur from Port Klang ? Hi, you can take KTM from Port Klang to Putra, then walk to Jalan Raja Laut and take GoKL Bus to HKL. Hi, you can actually take Monorail from KL Sentral to Chow Kit, and walk to HKL. ì am having degenerative lumbar scoliosis and cannot walk too far. are there any buses ì can take that would stop in front of Hospital Kuala Lumpur ? Hi, can I know which entrance of HKL that you are going to? If thats the case, you can take the GOKL Red Line which will stop near to Monorail Chow Kit, just cross the road will be HKL Jalan Pahang. take from KL Sentral is it ? how to take train from Hospital Kuala Lumpur to MRT Cheras ? Hi, you can take Monorail from Chow Kit to Bukit Bintang, then you can transit to MRT. how to take trains to Cheras Taman Mutiara from Port Klang ? Hi, you can take KTM from Port Klang to KL Sentral, then take MRT to Taman Mutiara.